CTLT's Communities of Practice (CoP) provide connections and shared expertise for groups of individuals with common goals and similar challenges. 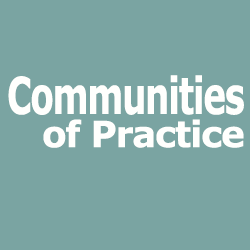 Communities of Practice are distinguished by three characteristics. Members (1) share a domain of interest, (2) engage in activities and discussions to share information and develop relationships, and (3) develop a repertoire of resources, experiences, tools and methods to enhance their practice. Membership requires only active participation and constructive contributions to the community. Regular gatherings are informal and lightly facilitated to offer opportunities for connecting with others and learning to become a better practitioner. This is an interdisciplinary community of scholars who meet bi-weekly to collaborate on the design and implementation of assessments of sustainability across the curriculum at Cal Poly. Participants will have opportunities to connect with colleagues in many disciplines who share an interests in sustainability and to exchange knowledge and insights relevant to teaching and scholarly work related to sustainability. These activities are in support of Cal Poly's Sustainability Learning Objectives. For more information please attend the next meeting on Friday, January 19 from 2-4 pm in 33-285 or contact Brian Pompeii at bpompeii@calpoly.edu . Membership is achieved simply by providing your contact information so that you can be be informed of activities. Participation is voluntary and welcome at whatever level of engagement you desire. Fisher Science (Bldg 33) Room 285.